(TRENTON) – A team from High Tech High School, Hudson County, took top honors in the New Jersey Envirothon, a natural-resource problem-solving competition that drew more than three-dozen teams of high school students from across the state. The Envirothon -- held Saturday, May 7th, at the North Branch Park in Bridgewater, Somerset County -- tested students’ knowledge of natural resources through interactive problem-solving at six testing stations. These stations focused on soils, aquatics, forestry, wildlife ecology, team presentation problem-solving and natural resource management in the urban environment. The team from High Tech High School won by demonstrating the most comprehensive understanding of natural resources and the best teamwork and communications skills. 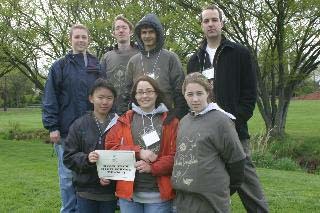 The team will advance to represent New Jersey in the 2005 Canon Envirothon competition July 18 - 24, at Southwest Missouri State University in Springfield, Missouri. Runner-ups were teams from Hopewell Valley Central High School Team #1, Mercer County (second place); Vernon Township High School, Sussex County (third place); and Hopewell Valley Central High School Team #2, Mercer County (fourth place). Horizon awards also were presented to teams from schools participating in the competition for the first time that earned the highest score at an individual testing station. Horizon awards were presented to: Somerville High School for the Aquatics, Current Issues, Forestry, and Wildlife stations; and the Monmouth Regional High School Life/Environment Club for the Team Presentation station. The New Jersey Association of Conservation Districts and New Jersey Department of Agriculture’s State Soil Conservation Committee are the prime sponsors of the Envirothon. Other sponsors are the United States Department of Agriculture’s Natural Resources Conservation Service, Rutgers Cooperative Extension, the New Jersey Department of Environmental Protection and the 15 state Soil Conservation Districts. For additional information about the NJ Envirothon and how your school can participate, please contact Rich Belcher, NJ Envirothon Coordinator, at (609) 633 –2549.